A couple of weekends ago I got together with Sophie, from Stone & Sage, for a day of vintage shopping in Long Melford. When I first met Sophie we bonded over our love of vintage shopping, and she promised to show me around her favourite haunts. 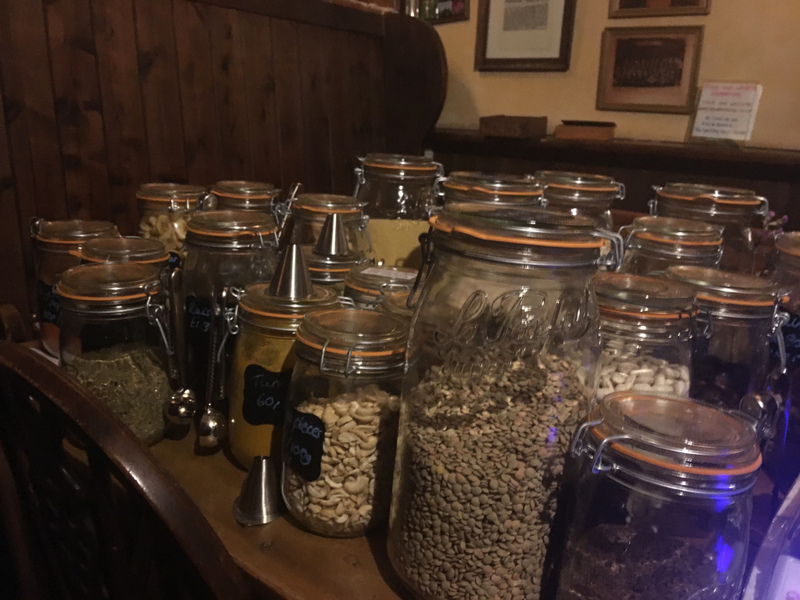 We started out at The Long Melford Tea Room– well, you can’t shop on an empty stomach! We had a cuppa and teacake on gorgeous floral china. 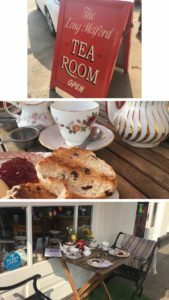 If you’re looking for a classic tea room in Suffolk then I would recommend stopping by. 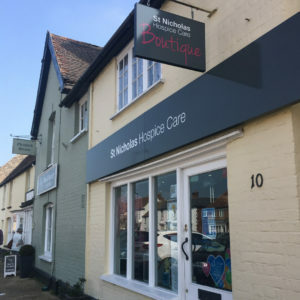 Our first shop of the day was the St. Nicholas Hospice Care Boutique. 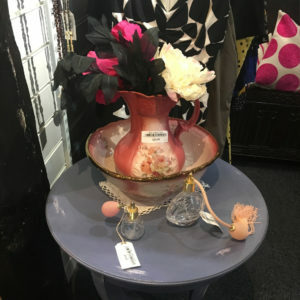 The charity shop has been carefully designed to make it a joy to look around. 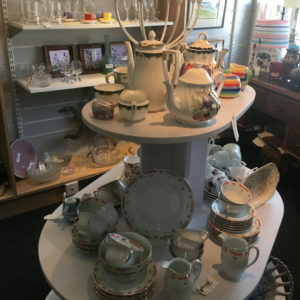 We headed straight for the homewares and found some beautiful vintage china and glassware. 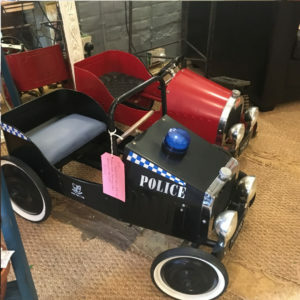 There was also some old Victorian items including a children’s toy and what looked like a crib that had been transformed into a coffee table. 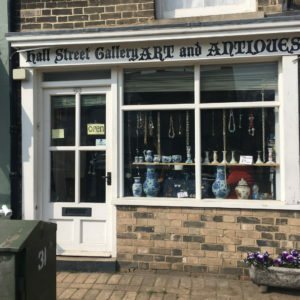 Next we headed to the Hall Street Gallery, Art and Antiques. This shop has lots of Asian inspired items. 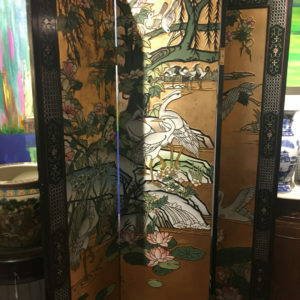 I fell for a stunning painted screen, it is such a statement piece – I just wish I had a big enough house for it! 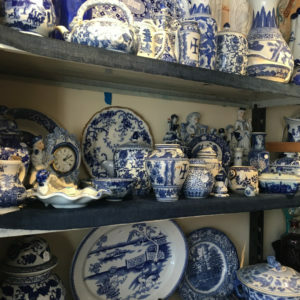 The shop also had a huge amount of blue and white ceramics, which are very popular right now. Sophie explained that they are very on trend for spring and she sees them flying out of the Stone & Sage shop. 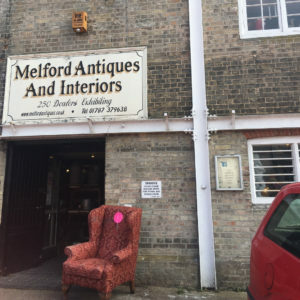 Our last stop was the Melford Antiques and Interiors store. Now this place is huge! There are so many floors to explore and 250 dealers exhibiting inside. 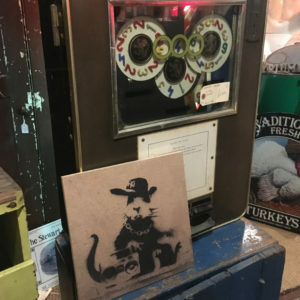 The first thing we came across was a Banksy…well, maybe? 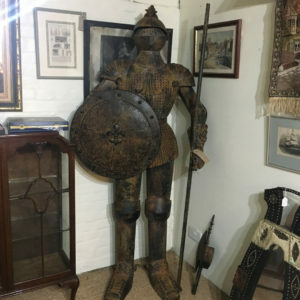 From bar carts to sewing machines, suits of armour to retro cameras, there was so much to discover. This place is vintage interior heaven! 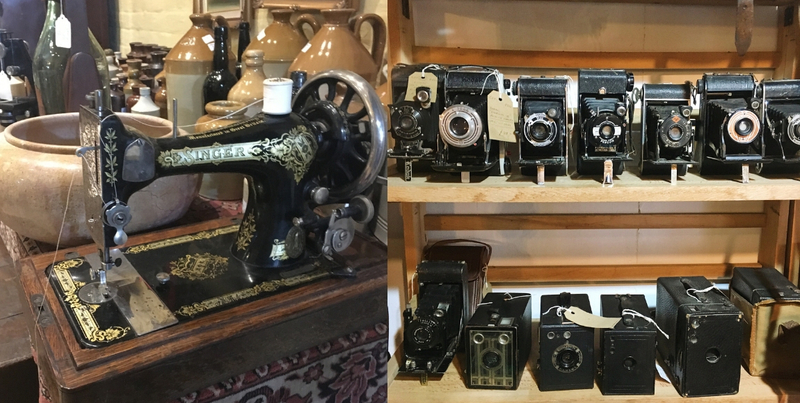 If you haven’t got the time to explore Long Melford’s antique shops right now, you can always head online to Stone & Sage and get your vintage fix – Sophie has stunning pieces for you this spring! 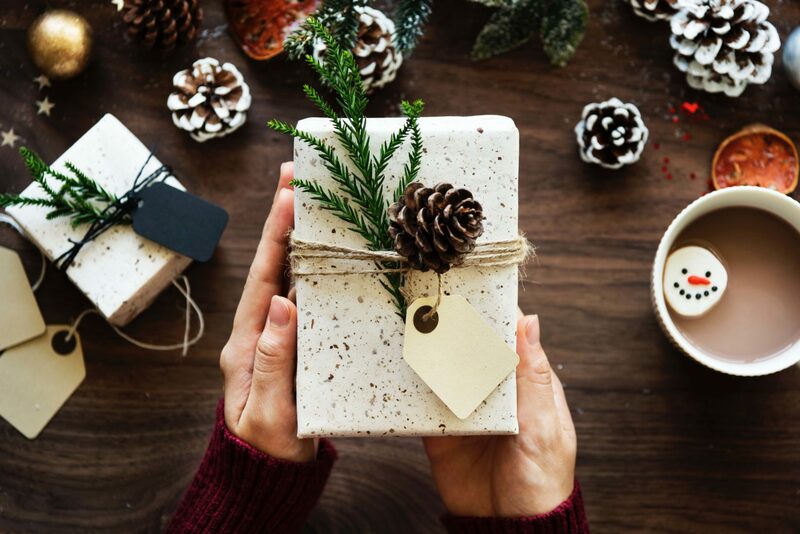 You can find her top seasonal trends on my previous blog post. Disclaimer: This is not a sponsored post. 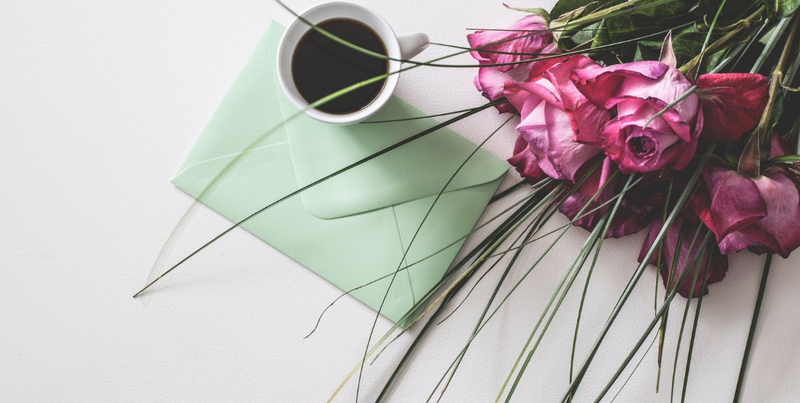 I have worked with Stone & Sage previously, but was not paid to write this blog post. To read my full disclaimer policy, click here. Next post Next post: Could a chemical peel at The Face Place help my dry skin?